The Green County Genealogical Society was organized for the purpose of bringing together family researchers who can network together and promote preservation of heirlooms and documents. Their goal is to help others find their ancestors, to educate them about genealogy, to copy cemeteries in the area and to stimulate interest in the county and genealogy. The Research Center is located on the lower level of the Monroe Public Library, 925 16th Ave, Monroe, WI. Their main holdings are Green County. Both Rock County and Lafayette County are well represented along with several other counties, states, countries and ethnic groups. A large collection of newspaper clippings which includes births, marriages and obituaries is also available. The Genealogical Society Research Center is open every Tuesday and the third Saturday of the month from 10:00 am - 3:00 pm, as well as the first Saturday of the month from 1:00 pm - 3:00 pm. Hours may change in the summer. Other times may be available by appointment by calling (608) 325-4755. For additional information information on the Genealogical Society or for questions on how to become a member, call (608) 325-4755. 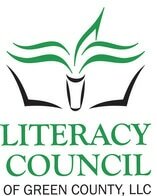 The Literacy Council of Green County provides person-to-person opportunities for anyone wishing to improve skills in reading, writing, and speaking the English language. Trained volunteer tutors work one-on-one with anyone requesting help with the English language. Personal tutoring to learn the English language is provided at no charge and is done confidentially by Literacy Council trained volunteer tutors. For additional information on the Literacy Council of Green County, we encourage you to visit the organization's website at literacygreencountywi.org. We are a part of Green County Libraries. We are a member of the South Central Library System.